I can’t fault this high chair (and for the cheap price it is that’s amazing!) it’s easy to clean, fold away and feels super comfy for my little girl- it folds back nearly flat so it doesn’t matter if my little one catches 50 winks after she’s ate! We bought the high chair when I was still pregnant so went for neutral so will do for baby number 2 as well! Also it was really easy to set up! 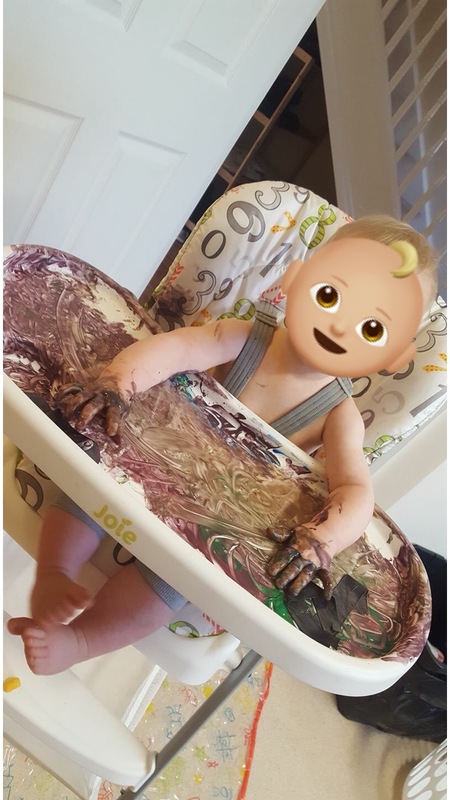 I paid £30 for this highchair and i cannot fault it at all. My 5 month old and 2 year old use it all the time. 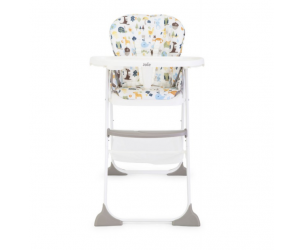 Great value for money, its better than our other highchair which also cost more! Foods quite small, storage basket and reclines. This was bought for at my girls grandparents house where she will be at least once a week for meals when I go back to work. She seems very comfy in it and the recline is handy for when we are using it to let her sit near us as she is still too small to eat and can’t always sit up straight for long periods of time but wants to be near us. The storage basket it handy for bibs, muslins and such. The main pro of this chair is the foldable element as it folds up quite small compared to most highchairs. The only real downside I have found is that the footrest is not adjustable so my little ones legs dangle and I think they will for quite a while. Would recommend this chair though. I bought this high chair for my second son as it reclined well and let him sit and watch the world go by before he started the weaning process. The compact and easy one hand fold is really useful and I can manage to do it with baby in one arm and highchair in the other. Nice, cute designs and large tray with a space for a drink. 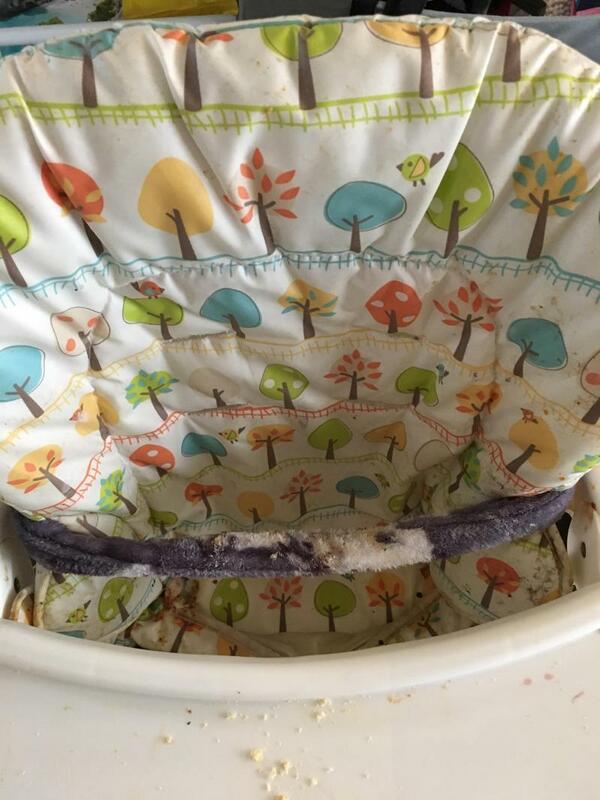 It is fairly pricey though and I find that food easily gets in to the little fold where the fold handle is based which can be a pain to clean but other than that, a great high chair for the before and after weaning stage. 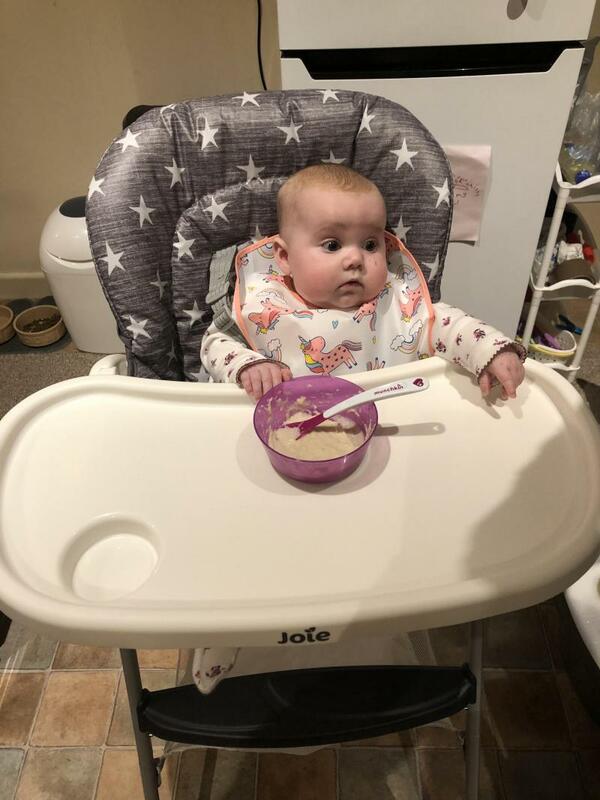 I was so impressed by this highchair, not only is it comfortable, love the design and how big the table is....but the net basket underneath is a lifesaver for storing bibs, wipes, muslins...anything to may need round a dinner time to grab if things get a bit messy. Also I love the fact the chair has different settings your child can be as upright or laid back as they like. Great product for the price. Can wipe clean easily, folds down easily. The only downside now my daughter is getting bigger (she's only 1) there is no adjustable foot rest so she is getting uncomfortable sitting in there now. This highchair is perfect for us. We don't have much space so the fact it folds pretty small is great for us. It so easy to wipe clean. I love the fact it reclines so I can lean her back a little for her bottle. We got a great deal as it was mothercare floor one unfortunately we didn't get the basket but I've heard great things! 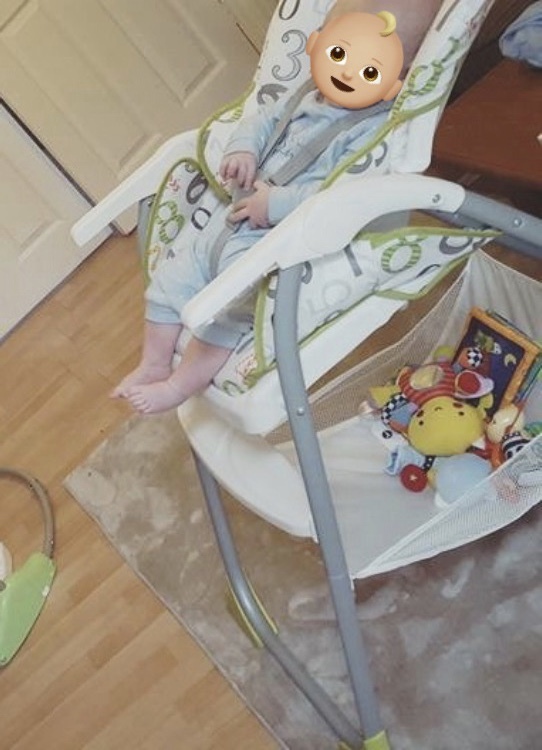 We bought this when our boy was 15 weeks old, and as it reclined pretty much to a 45o angle, made it fantastic for feeding/weaning, and even better if baby fell to sleep, simply pull the back lever and slowly control the recline so baby can lay back without being disturbed. We also used it when we didn’t want to put baby in a floor bouncer, especially when guests or the dog is roaming around the same room. We used it until he was nearly 3, and will 100% be purchasing another one for our new baby. It folds up with a hard tug of a strap, which can be done with one hand. Removable tray, seat pads, lower mesh basket and straps meaning when it gets a bit mucky that a wipe down can’t fix, it’s easy enough to chuck in a washing machine. We purchased this 3 years ago at nearly double the current RRP, and would happily pay that price again for what you get. This is a really good high chair. The tray is easy to remove and clean down and the seat is so simple to fold down. The recline feature is great for when my son falls asleep eating and I can just lie him back without messing around. The downside to this high chair is the seat is hard to clean in the little folds. The straps are easy enough to take off and wash but the seat itself is complicated. 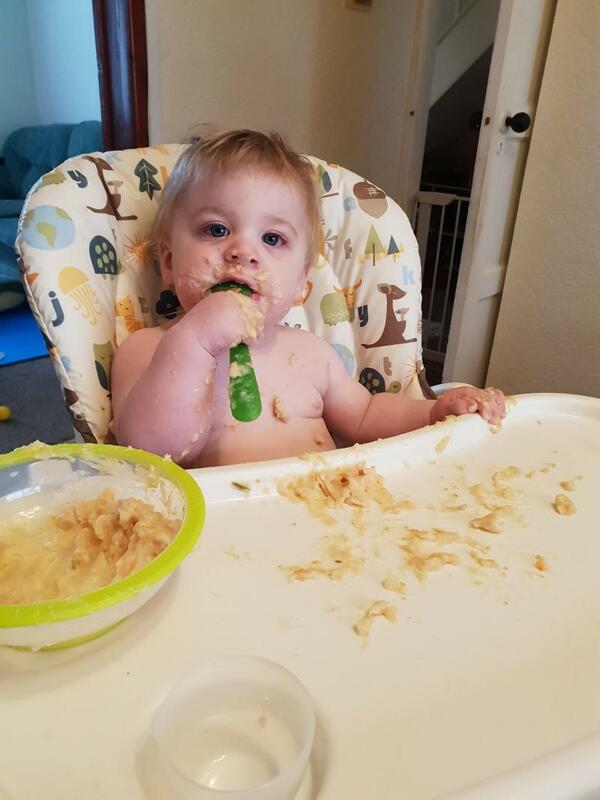 The highchair is great if you are looking for something you can store away in a compact way. The tray comes off for cleaning and the seat itself can be wiped clean. The basket at the bottom is an added bonus meaning you can out in wipes, extra snack packs etc meaning you won't have to leave the child unattended while you go to get those things you need. I have only had a problem after reclining the seat where the latch doesn't always go back into the track, it goes up the inside so it doesn't click and lock into place which can be dangerous if not noticed. We just shortly purchased this highchair. You can adjust three positions so you could sit already younger babies in it. It's a good height to join you at the table. The tray is big and can be removed. The fabric can be cleaned with a cloth, we didn't get so dirty yet to test a proper clean. Love the storage basket underneath. Perfect for us to collect some toys in the evenings. You can fold it with one hand. It also comes with a 5 point harness to secure your baby. Just the legs are standing out a lot so it's not a small high chair in total when in use. It comes in different designs. Love ours. to be sat up in it. It does feel a little awkward to adjust as you have to make sure the pegs fit into the holes so i would be a bit nervous to do it with him in it. It is made of great looking material which is wipe clean and doesn’t look like it has to many nooks and crannies that would be tricky to clean. The harness fastens well and is easy to adjust and release. I feel like my son is secure when he’s in the chair but can get him out easily if needed. Overall I’m really happy with this high chair. 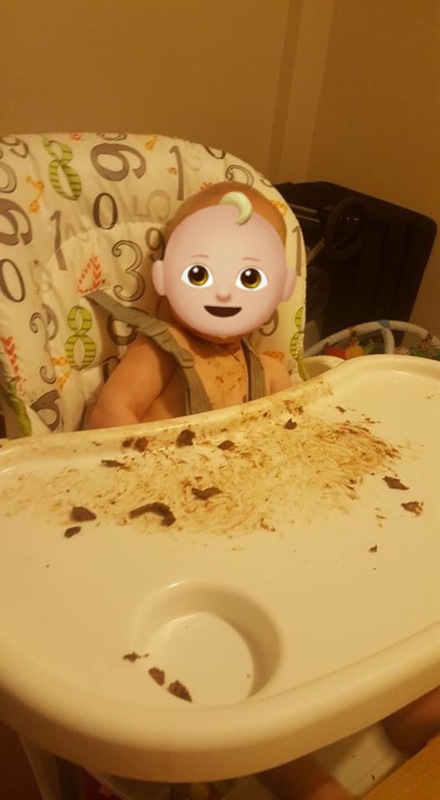 Easy to clean after a meal. Seat is soft and comfortable for baby. Storage basket is so useful :) highchair is easy to fold and store! Lovely beautiful high chair, very sturdy and my son love's. Comes with handy storage underneath which I tend to hold a few toys. 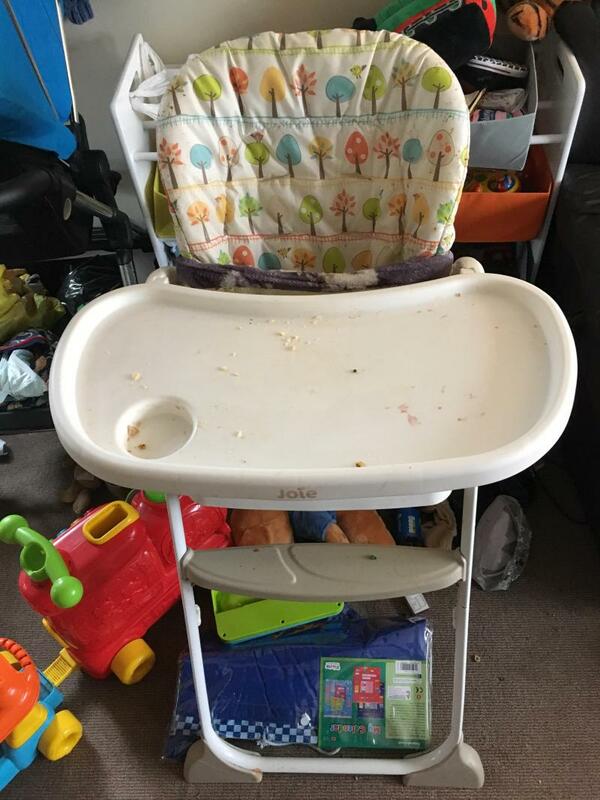 I love this highchair, it folds down so neatly, it reclines for young babies, the straps are easy to use, it has a large tray with cupholder. It has been fantastic value for money. 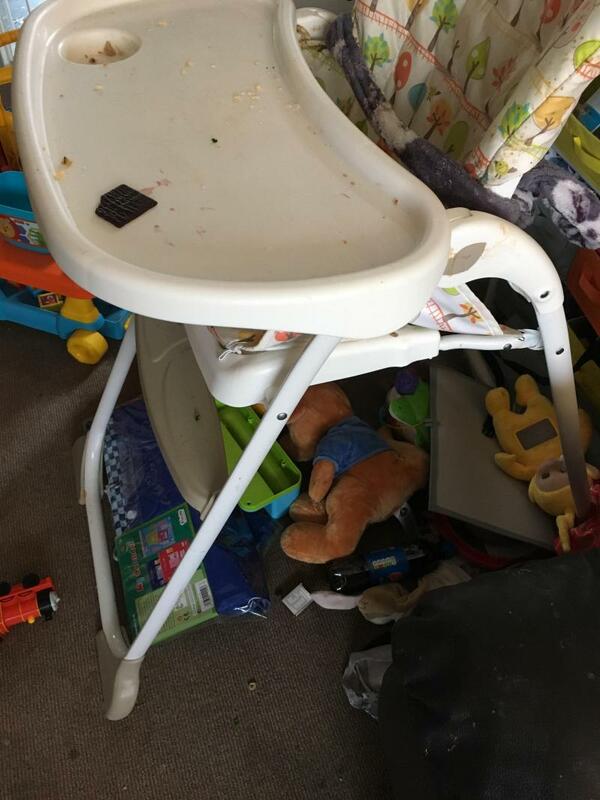 I have read that people find it tricky to clean but I haven't found it any different to various highchairs I've used over the years. I prefer the cushioned chairs like this one, maybe a solid plastic or wood chair would be easier to clean. I've found no problem in removing the seat cover or the straps and they've survived the washing machine several times. Too many nooks and crannies to clean! Straps are a nightmare to remove. I take them off and put them in the washing machine in a pillow case as only way they seem to clean. My only bugbear is how hard it is to clean! Hard to clean in all the little places. Lovely, hard wearing, study. The tray is easy to slide on and off for easy cleaning. Folds really easy for quick storage however the straps are hard to clean as well as all the creases on the body of the high chair. This has been a solid high chair for our little one who always looks comfortable in the chair. The tray can be removed for cleaning, however, the straps cannot and they do get dirty quickly. The material the straps are made doesn’t help food/stains being wiped off and makes them appear a little discoloured after scrubbing and wiping clean. It does have some storage underneath which is useful for storing toys that are easily accessible. 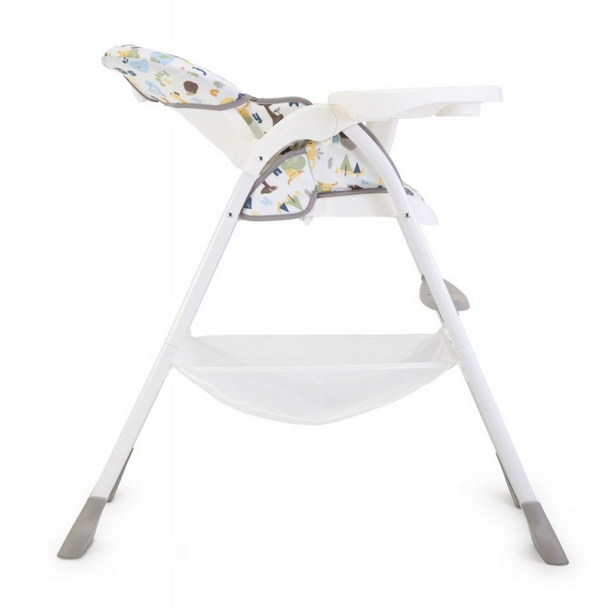 Overall we have been pleased with the height, reclining features and it is a solid comfy high chair! The chairs folds so saves space. It's padded so is comfy for the baby and can be used from early on. I used this seat for both my children, it's comfortable for them and can be used from an early age as the seat had three recline positions. I found the fact the chairs folds very useful as it saved space and I could fit it in the car if I ever needed too. The down side to this chair is I found it hard to clean it has lots or cracks the food can get stuck. The material straps get dirty and I think would be better with a plastic cover. Overall I liked this chair and found it comfortable and practical with the only down side being the effort needed to clean it. 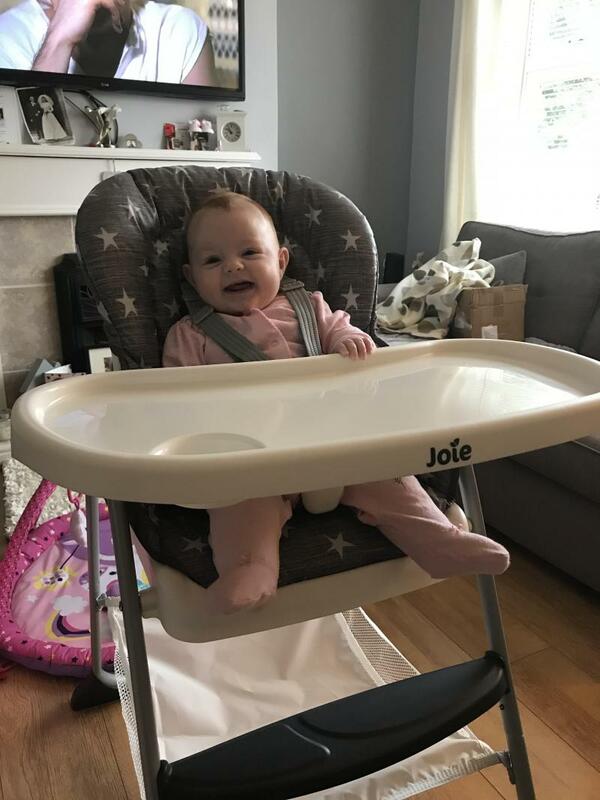 I am like this joie highchair, because this product have few difference high level for arrange and not to heavy, so that quite easy to move my baby. And the vision is very soft. My baby look like comfortable. I bought this high chair for my 6 month old daughter. She loves sitting in it not just to eat but to play with toys on the tray. It is nice and fitted in the seat part and gives her lots of support. I love the one hand folding mechanism. It’s so easy to move around. Nice and light. The design is good, we have this but with the star pattern. I like how the test attaches to the back of the high chair legs too. We got the chair as a Christmas present and we like it. It's very comfortable and easy to wipe off. However it does take up a lot of space and it's difficult to get the cover on and off to clean. Perfect highchair. Nice high back which is cushioned. Straps are removable so they can be cleaned which I found I needed to do regularly as being white they stained easily.nice size table with cup holder. I didn't find much use for the recline back to be honest other than that it did the job we needed. 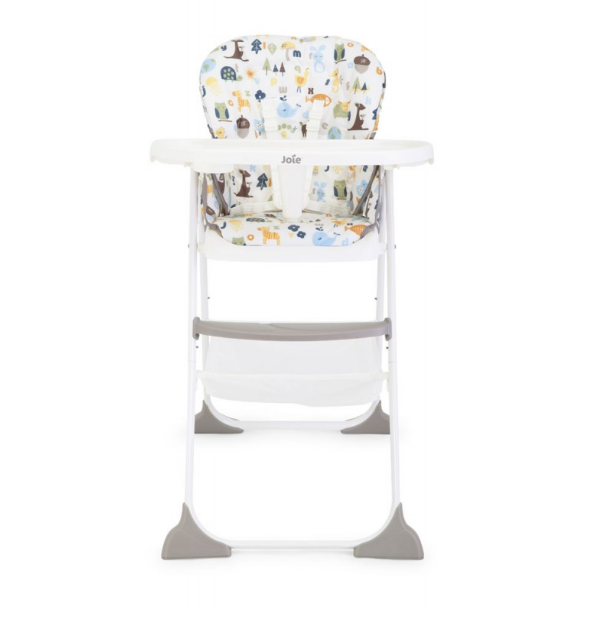 It's time for food, in the fantastic Joie Mimzy Snacker Highchair. The comfortble seat pad is wipe clean and removable, and with a 3 position recline your little one is sure to be comfortable. Safe and secure with the 5 point-harness, and adaptable 3 position footrest. 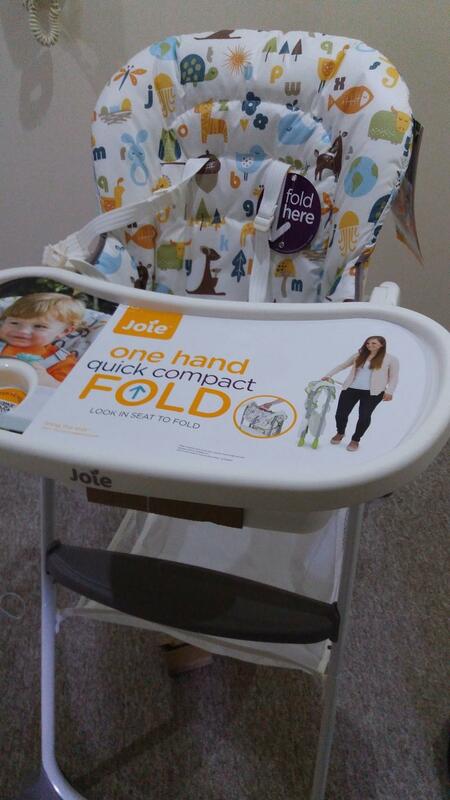 When you need to store it away, the Joie Mimzy seat has a one-hand, quick, compact fold which is easily to accessed from the middle of the seat.